GORGEOUS GULF FRONT!!! RIGHT ON THE BEACH! This STUNNING, FULLY RENOVATED townhome could be your perfect Destination vacation for your Wedding, Family reunion or just a quick coastal get away! just Let us know when you need it! Serenity at Summerhaven is a perfect fit for all your luxury vacation needs any time of year! This lovely, four bedroom, three and a half bath townhome has been NEWLY RENOVATED AND DESIGNED ! Freshly updated interior paint, new ship lap, granite countertops, ceiling fans, light fixtures, furniture, luxury linens, complete with a newly decorated kitchen with stainless steel appliances and new accessories!!!! PLUS... a 50 inch flatscreen in your living room! 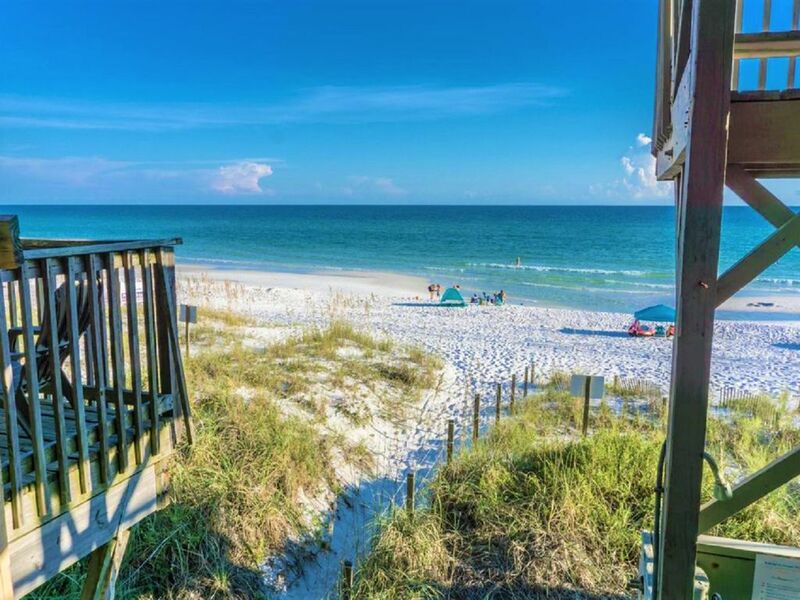 Sits RIGHT ON the Beautiful White Sand Beaches of the most Beautiful emerald coast water ! Easy Access to your own private beach from the back of your deck! As well as plenty of room on the sand for All of your friends and family! Not to mention , it comes Complete with the most Magnificent gulf views! Small private deck Off the main level living room, perfect for evening cocktails or spot to relax off the sand ...and set of stairs that lead you right to the sand on YOUR PRIVATE BEACH!!!! PLUS an out door shower For your convenience ! ...keep the sand rinsed from the tiny feet that run through the house! Enjoy new furnishings, Flatscreen Televisions in 4 bedrooms, as well as the living room, a full-size laundry room complete with ironing board and additional accessories. Also, 2 full size convenient parking spaces for 4 right in front of your unit! Can it get any better !!!! ?? Or on the deck with morning coffee ! Summerhaven rests just minutes from the luckiest little fishing village in the world.... DESTIN, FLORIDA. Fresh fish right out of the Gulf! You will have your own private beach with the other Summerhaven guests for A fun, peaceful getaway for you and your family! As far as your “what to do” list.... you are close to all the action! The BEST Restaurants at your doorstep! The Beach Bar is right next door! Enjoy their evening beach bonfire . Whales Tail, Pompano Joes and Captain Daves are less than a mile away !! Of course, A little recovery time from the sun... a bit of shopping never hurts! From High-end designer boutique shops To gypsy storefronts, There’s A little something for everybody less than 10 minutes away with the Silver Sands Outlet Mall or Destin Commons! There’s also golf /tennis in Sandestin Resort and the very popular Baytowne Wharf where you will find games, activities, restaurants and more shopping for a day of fun off the beach ! Sugary White Sandy Beaches and Emerald Green Water. WE cannot wait to have you over for a week or two ! It is on the gorgeous Emerald Coast. My family just returned from this gorgeous property. We wanted to ring in the New Year down south and we had a fantastic time. The townhouse is laid out so beautifully we all have plenty of space. The owner had all the little things you need in a kitchen to prepare dinner as well as plenty of towels and linens. I appreciate the cleanliness of all the rooms and bathrooms. It was just lovely and I would highly recommend it to friends and family. That's great! I am so glad that you all had such a good time. It matters greatly to us that guests find our home clean and well appointed. This property is practically perfect in every way. It is DIRECTLY on the beach which was very important to our family. There was a lot of space, inside and out, to spend time together or alone. It is very nice inside and had everything we needed. It is close to everything. There are tons of restaurants, shopping, and full sized grocery stores nearby. Thank you very much for taking the time to review your stay. It is so important to us and helpful to fellow travelers. We are very happy to you and your family were so pleased and we hope to have you back to the beach soon! We had everything we needed at our finger tips. The kitchen was well stocked and two of the bedrooms overlooking the Gulf were breathtaking! The house was clean and well maintained. We did not do too much eating away from the house that week but when we come back in July we have all intentions of doing just that!!! My friend is booking it for her birthday in August..
That's wonderful! We are so happy that your group had such a great time. You were terrific guests and we look forward to having you back for your next beach vacation.